But…. okay no “buts” going to try! Nanomini. A small version I have invented for self with the excuse of new baby and no sign of sleep. 250 words a day. It is enough of a challenge. Encouragement to all. Bloggers. Writers. Editors. And especially lovely you! NaNoMini is a beautiful idea. Gorgeous. Small and perfectly formed, like your short stories. Thank you. That’s fabulous news that you are editing. Hmmm… I thought I might just rise to this challenge, but in the cold hard light of post-dinner-and-wine time, I remember that we have a silver wedding celebration coming up, with various others around the same time, and a bit of travelling, so it’s a forlorn hope that i could see it through. Don’t let me stop you, though. I guess I could use a challenge but that means starting TODAY, right? I’m in. 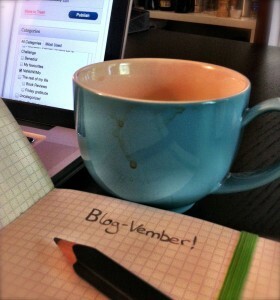 I have 2 blogs that need a kick up the pants so I think I will alternate between the two for the month. http://www.segoviadreams.blogspot.com & http://www.theiloveyousong.blogspot.com I’m here via Naomi. Thanks for the inspiration! There is nothing like a little kick in the pants to get you moving! Oh me! I just can not commit the time needed for NaNoWriMo, but I can just about get my head around blog-vember. And if I start writing post after post on writing reports, you have my permission to withhold gin from me. I could never withhold gin from you. That would be cruel. Thanks for the encouragement. I read some of your September posts but embarrassingly, not all. You are going to play though, aren’t you? Aren’t you?